All residence halls and houses will close on Saturday, December 19 at 11 a.m. and will remain closed until Sunday, January 10 at 9 a.m. Students should make their travel plans accordingly. For more information, see the Residence Life Winter Break Information webpage (http://www.cornellcollege.edu/residence-life/living-on-campus/winter.shtml) or members of the Residence Life staff in Old Sem. Stressed? Check out the Stress Free Room at the Counseling Center! Did you know that the Counseling Center has a Stress Free Room? It has stress management resources including a massage chair, biofeedback software, books, brochures, and calming music. You can schedule a time to use the room online, by calling 319-895-4292, or by stopping by Ebersole. Check out https://www.cornellcollege.edu/counseling/stress-free-scheduling/index.php for more information! 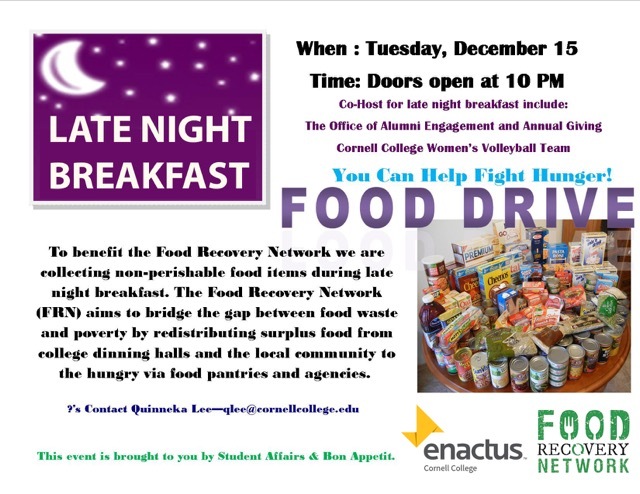 Late Night Breakfast on Tuesday!